Hi everyone. 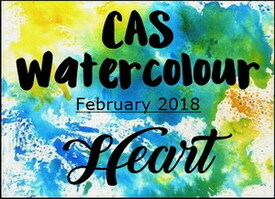 Welcome to the start of the CAS Watercolour February Challenge. This month is being hosted by Bonnie and she has picked the perfect theme! I lightly spritzed with shimmer mist and then used the folder to "stamp" onto a piece of regular white card stock. Because there wasn't too much spray, it worked well and I got a very dark impression. There was still ink on my folder, so spritzed again and pulled a second print. The third print was pulled without adding more spray ... that's the background I used above. I love the softness and randomness of the design. I die-cut the Love from a piece of scrap which I had sponged with Picked Raspberry distress ink. After die-cutting, I used my ink pad directly to the sentiment to add just small strokes of deeper pink. I then sprayed with shimmer mist to add sparkle. I tacked down the Love die-cut with glue just in random places so that some of the pieces were left free, giving added dimension. I added several clear sequins for even more sparkle. We are thrilled to have Sue (Sue's Card Craft) as our Guest Designer this month. Please check out the challenge blog to see Sue's Heart card, along with the amazing designs from the other team members. Then come join us! Remember to include watercolouring on your CAS (clean and simple) designs. I have to do some more embossing folder stamping - I'd forgotten what lovely results are possible. This is beautiful - wonderful shades of pink from vibrant to very pale. Perfect to stand alone with just the one word sentiment and the subtle sequin embellishment. Loll, this is so dreamy and artsy, and love your embossing folder background. Oooh, this is very pretty. You introduce to me to so many new (to me)products and ideas. Haven't heard of the Magicals before. What a neat background you can achieve with them. Thanks so much for sharing! The effect you achieved with the powders and embossing folder is so pretty, Loll. Gorgeous card! This is a definite "WOW" on that background! It's gorgeous! The fade and random pattern couldn't be more perfect. How perfect to just add the die cut sentiment and the sequins are the perfect final touch. What a gorgeous background and I know it shimmers beautifully! Your technique of coloring the die cut was brilliant! A beautiful, beautiful card, my friend! 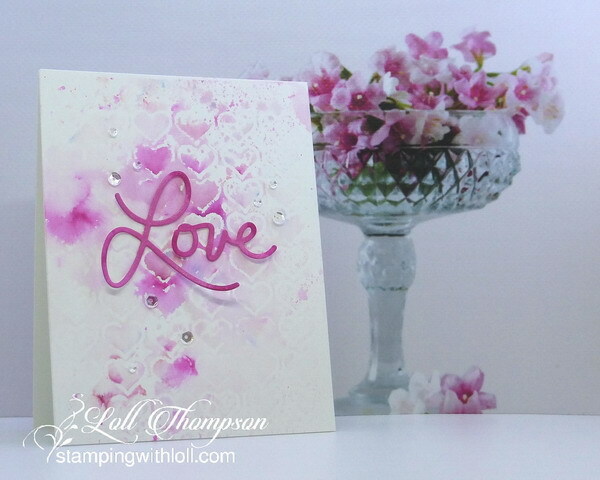 such a lovely card and that shade of pink is fantastic...love the artsy look your card has Loll. Everyone already said it and I agree, Loll. Very artsy. And lovely. Absolutely GORGEOUS card, Loll! 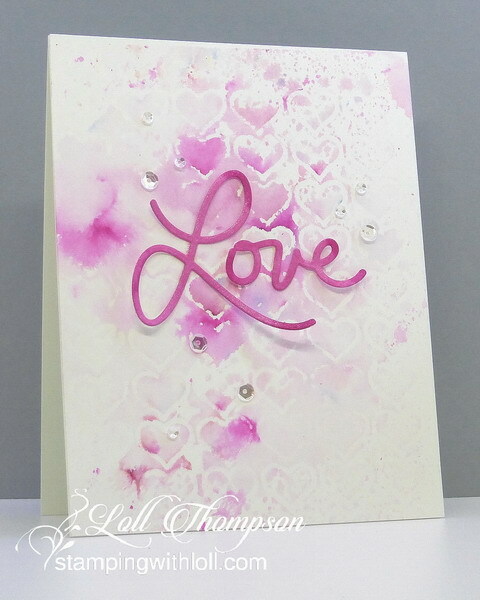 Your EF technique with Magicals creates such a striking effect, and I love the shade of pink that you chose for this card! Loving the elegant font on your sentiment, too...WOW! Beautiful and dreamy. Fantastic EF stamping... love this technique. Gorgeous and artsy! Love it! I smiled at the sight of this card. I love color patches, I love how water worked with pigment. It is always so fascinating !! So very beautiful Loll. Awesome background with the embossing folder.